MOSCOW (AP) As must have been the case with the first glimmers of electric lights in the 19th century, video assistant referees benefited from an initial ”Wow! The technology works!” buzz when they first plugged themselves in at this World Cup. Many observers were quickly won over, like wide-eyed kids switching on new gizmos. But the VAR system’s pernicious impact is apparent, too. Instead of the referees’ uniform the screen-watchers theatrically wear as they scrutinize the action and replays in FIFA’s self-important ”VAR Room” (sounds like ”War Room,” get it? ), they should wear aprons. Because their introduction is dirtying fundamental charms of the game that long managed perfectly well without them. The clear and simple spectacle of football – 22 players regulated by a small team of on-pitch officials whose decisions, right or wrong, had the merit of being easy to see – is losing that sharpness in a VAR fog. Why are referees using video assistance in some instances and not in others? It isn’t crystal clear. What exactly are the video officials, from their room in Moscow, saying into the earpieces of referees at the stadiums? Also unclear, because tournament organizer FIFA isn’t airing the exchanges. And why, oh why, with referees and assistants on the field, four pairs of VAR eyes, banks of screens and super-slow replays at their disposal, are officials still making mistakes? Perhaps fewer of them, but mistakes nonetheless. That last question is simple: Because they are human. Their fallibility was easier to accept before VAR. Until now, football imposed the idea of human imperfection on players and fans. The sport’s unwritten pact was that it is a fast-moving game inherently riddled with opportunities for refereeing mistakes. That also made it a useful channel for broader lessons about life and its imperfections. Can’t swallow that? Try curling or some other genteel and insipid pastime. That is why, in football, referees decisions are final: So they still have absolute authority even when they get things wrong, as they always will. The addition of the VAR system, however, undermines that philosophy, because it peddles the idea that technology might move refereeing closer to perfection. Now, when errors still slip through and beat the system, more people are made to look bad and the mistakes are harder to forgive than when they were committed without technology by a smaller group of officials. Previously, you might have bad-mouthed referees’ blunders but, if you were reasonable, you also were more likely, in your heart of hearts, to have understood how they could happen. But with VAR, well, what’s the excuse? VAR has prevented some injustices at the World Cup. Arguably the best example is the penalty that Dutch referee Bjorn Kuipers awarded to Neymar against Costa Rica but then took away after seeing on video that Brazil’s star flopped and wasn’t fouled. Sparingly employed, VAR hasn’t rendered matches as choppy as the replay delays in American football. But short pauses while referees consult pitch-side monitors do feel intrusive in what used to be a more seamless game. On the occasions when VAR failed, inexplicably missing fouls, intervening in borderline calls or being used unevenly, the sense of injustice is aggravated because the technology has further lowered tolerance for mistakes among players, coaches and fans. With VAR has come the quickly tiresome sight of players and coaches now regularly haranguing officials by drawing a TV-shaped square in the air with their fingers, pushing for VAR’s intervention. It’s not pretty. Better communication on VAR’s use and non-use would help. Serbian football association Vice President Savo Milosevic fumed ”What are (those) guys doing up there?” after German referee Felix Brych didn’t use video to review a WWE-style takedown of Serbia striker Aleksandar Mitrovic by Switzerland defenders Stephan Lichtsteiner and Fabian Schaer. 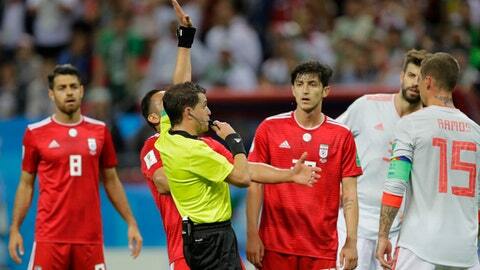 Carlos Queiroz, the experienced Portuguese coach of Iran, also had a point with his furious complaints about opaque VAR decision-making after contentious calls in a 1-1 draw with Portugal, including a debatable penalty for Cristiano Ronaldo and, inexplicably, no red card for the Portuguese star when he put an elbow to the face of Iranian defender Morteza Pouraliganji. ”The referees have almost abdicated making a decision,” he said in a phone interview. Barber also says VAR is overkill, ”a little bit sledgehammer and nut,” because before its introduction top referees were getting the vast majority of big decisions right. With time, VAR wrinkles will continue to be ironed out. If VAR modifies players’ behavior, dissuading divers and penalty-box wrestlers, that will be welcome. But the game and people are messy. Hopefully, we’ll always be accepting and understanding of that.